But she said jobsworth staff demanded she produce evidence of her chronic illness – despite the fact she was in a wheelchair and her body is the size of a 10-year-old’s. 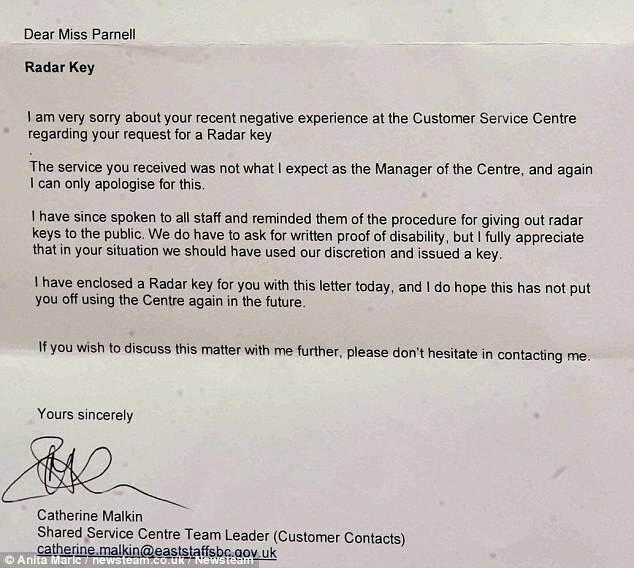 ‘I asked the receptionist if I could buy a key and she said she couldn’t give me one unless I could prove that I was disabled,’ said a shocked Ms Parnell. ‘She said I’d need to go home and come back with some identification; either my blue badge or a letter showing my disability living allowance. ‘What more proof did she need than me being in front of her in a wheelchair? I clearly look disabled. ‘She told me she couldn’t access my details and she could no longer help me unless I had proof of my disability’, she added. ‘I was completely stunned and upset by what happened. I was shocked. I felt discriminated against. A spokesman for East Staffordshire Borough Council said: ‘The council prides itself on good customer service and it is unfortunate that Ms Parnell’s experience was not a positive one. ‘The issue with the key has been resolved and the customer has been contacted. ‘Our staff are well aware that, while there are guidelines to follow, they can, and in the majority of cases do, act with an element of discretion, as should have been displayed on this occasion.